Managing trustee has no idea how these articles came into the possession of Otis or when. This is not the first time that the Government of India and the Navjivan Trust are involved in a controversy over the auctioning of Mahatma Gandhi’s belongings. The current James Otis incident may not be the last time either. “It is only when someone makes a claim of possessing Gandhiji’s belongings and threatens to auction them that we come to know about their existence. It is quite possible that some of his belongings, original manuscripts of his letters and writings and other artefacts are being held by someone somewhere in the world and may come up with the idea of auctioning them,” said Jitendra Desai, the managing trustee of the Ahmedabad-based Navjivan Trust, set up by the Mahatma in 1929. Mr. Desai, however, has no idea how these articles came into the possession of Mr. Otis or when. He is also not sure whether all of them are originals. He said during his lifetime, Gandhi had gifted many of his personal belongings to people close to him, who in turn might have “sold” or “gifted them away” to some others. He said the wire-rimmed glasses in Mr. Otis’ possession seemed to be the one that Gandhi gifted to the Nawab of Junagadh in mid-thirties. He had no idea how it reached Mr. Otis. The pocket watch under the hammer also seemed to be one of the original watches Gandhi used from time to time. But he had no knowledge about the authenticity of other articles on auction. “It is for the auctioneer to establish the authenticity and certify the articles to be originals,” he said. 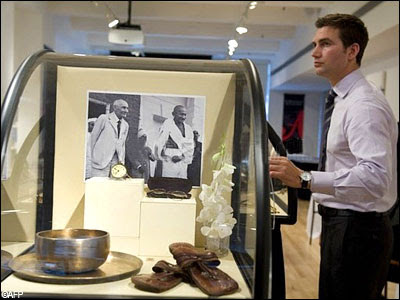 Pointing to a photograph captioned “Mahatma’s Earthly Possessions,” showing a list of his personal belongings kept at the Gandhi memorial in Delhi, Mr. Desai said replicas of many of his original belongings, particularly his utensils, were prepared from time to time for keeping in various museums for display. Even “Hriday Kunj,” the hut in the Sabarmati Ashram here where Gandhi lived for more than a decade, had replicas of many of his articles. There were also reports of some of the replicas having been stolen from various places from time to time. “Who knows whether any of the replicas are now being passed on as the original” he said. The list of original belongings on display at the Gandhi memorial clearly shows his dinner bowls, wooden fork and spoon, his famous porcelain set of monkeys, diary, prayer book, watch, spittoon, paper knives and two pairs of sandals. “I do not know which pair of sandals is in the possession of Mr. Otis,” he said. At the moment, the Navjivan Trust did not possess any of Gandhi’s belongings. “We don’t have to keep them here. They are for posterity to see and get inspiration from. So they had better be kept in some museums or exhibitions,” he said. If there was another claim in future about Gandhi’s belongings, “we will again take up the matter with the Government of India for settling,” he said. A couple of years back, the Trust had adopted a resolution authorising the Centre to take up such cases on behalf of the Navjivan if any claim of ownership of Gandhi’s belongings made from any corner of the world. The first such case fought by the Trust with the support of the Central government was in the Madras High Court in 1996 when V. Kalyanam, who was Gandhi’s personal secretary and typist during the Mahatma’s last days, threatened to auction some of the original manuscripts. Mr. Kalyanam kept the originals with him after typing the copies and later wanted to auction them. The second time was a couple of years ago when the Government of India and the Trust managed to retrieve the original manuscripts of Gandhi’s two letters, one written in June 1935 and the other in January 1948, that the Christies in Britain threatened to auction, though both were letters published in the collected works of Gandhi. While in both the cases, the original owners intended to collect some funds through the auctions, the 86-year-old Ghansham Chandra, a resident of Nagpur, was an example in devotion. He recently handed over to the Trust two original manuscripts of Gandhi’s writings without demanding any money. At the age of 18, Mr. Chandra joined Gandhi at his Sewagram Ashram, Wardha, in September 1941. Gandhi had scribbled condolence messages for two of his associates in February 1942, one in Bilaspur, now in Chhattisgarh, and the other in Lahore, now in Pakistan. Mr. Chandra sent the telegrams and kept the original scribbles with him.